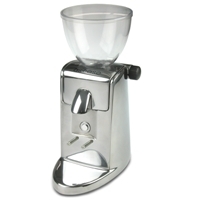 This is the smallest coffee grinder of the Ascaso range. It is designed and engineered to be the perfect pair of home coffee makers ascaso . Its size does not compromise its professional features, still a good choice not only for home if not professional establishments that work with different varieties of coffee (origins and decaf). Micrometric Regulation System to control the quality and consistency of grinding and adapt to the different possibilities of making coffee or the different types of coffee: espresso, long black, French press, etc. Hopper made ​​with a special plastic high strength and performance, which makes it unbreakable. Transparent and cover included. The milling system is made of brass with proffessional rotating steel blades diameter 54mm, and easy to clean. The nozzle holder can load directly from the grinding chamber. It comes in two finishes, aluminum or ABS plastic. In aluminum, there are two options: polished and painted (only available in black). The brushed aluminum is the flagship product of I mini. This finish is achieved by polishing the pieces by hand, one by one. Possible polished surface irregularities are due to the craftsmanship and painstaking process that we want to preserve for its delicacy and which brings a distinctive characteristic to each piece. It has optional electronic timer.